Author note: Lightly sweetened whipped crème fraiche is folded into this rich and decadent cinnamon rice pudding. This chilled dessert is infused with vanilla and cinnamon to create a warm flavor profile. 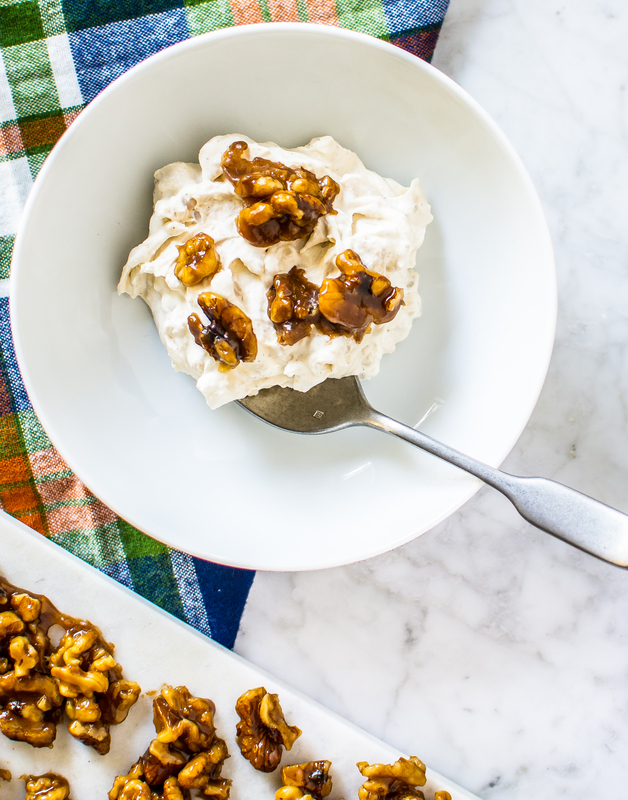 The brown butter bourbon candied walnuts add the perfect crunch to each bite. Place the half and half, cream, salt, ground cinnamon, vanilla extract, vanilla bean seeds, sugar and cinnamon stick into the electric pressure cooker. Using the sauté feature, cook for 7 minutes. Whisk occasionally to incorporate the ingredients and to prevent browning. Secure the lid onto the pressure cooker. Cook on high pressure for 5 minutes. After the 5 minutes, turn off the pressure cooker. Place the eggs and egg yolks into a medium sized-bowl. Temper the eggs with the some of the cooking liquid from the pressure cooker. Add the tempered eggs into the pressure cooker, constantly whisking as you pour. Spoon 4 tablespoons of rice pudding and 4 tablespoons of whipped crème fraiche into a small serving bowl. Gently fold the two together. Top with chopped brown butter bourbon candied walnuts. Serve chilled. Place all ingredients into a large bowl. With an electric mixer, whip on high until stiff peaks form. Store in an airtight container in the fridge.